The Friends of Clyde River Historical Committee received a donation to our archives of a small trunk/sea chest with the initials H.S.B. on its lid in brass nail heads. This trunk belonged to Barbara Stewart’s great-grandmother, Helen Stewart Birnie Stewart. It probably accompanied her in 1846 when she travelled to the Island with her husband Robert Bruce Stewart and their young children. Barbara wrote the following article to provide some background. My great-grandmother, Helen Stewart Birnie Stewart was born in London, England, April 20, 1815 (died 1871). Her father, George Birnie, was born in London in 1785, the son of Alexander Birnie and Anne Bayley. Alexander Birnie and his brother James were born in Aberdeen, Scotland. In London, they became ship owners and captains of whaling ships, operating in the South Pacific. James Birnie settled eventually in Australia. George Birnie emigrated to PEI in 1809. In Charlottetown he met and married (27.12.1810) Magdalene (“Lany”) Stewart, the daughter of Captain John Stewart. Their home was at 26 Great George Street, Charlottetown. With their first three children, they returned to London in 1813. Helen and the last two children were born in London. The Birnie family firm became bankrupt in 1838, and George Birnie returned soon after to PEI. The Birnie children remained in London with their mother. Son George Jr. emigrated to Australia where his uncle and family were established. In London, daughter Matilda married William Johnston and they, too, settled in Australia, as did the remaining Birnie daughter, Elizabeth. In London, June 27, 1838, Helen married Robert Bruce Stewart. His father, David, and uncle Robert, natives of Scotland then living in London, were acquiring land on the colony of PEI. 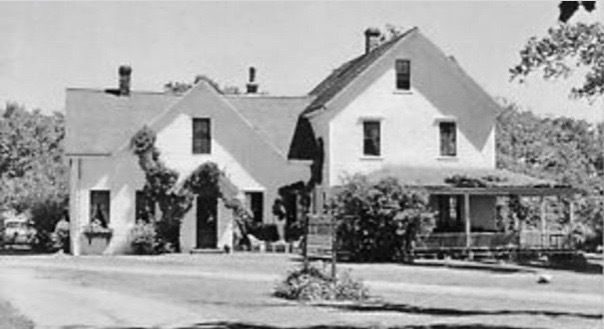 In 1846, with their five children Helen and Robert set out for PEI to settle on the property the Stewarts then owned here. That same year, Magdalene Birnie returned to the Island to join husband George. They died here – George 30.10.1863, and Magdalene, 21.08.1865. Both are buried in the Old Protestant Burying Ground – photo of George Birnie grave here and photo of Magdalene’s grave here. Helen and Robert Bruce Stewart had eleven children, eight of whom lived to adulthood. Helen died August 19, 1871. She was buried in the family cemetery at Strathgartney which her husband established upon her death. From then until 1931, several family members were buried there. The last was my grandmother, Anne Warburton Stewart, who died September 5, 1931. The family cemetery is located in a grove of trees just in behind the Communication Tower and several meters in from the new route of the Trans Canada Highway. The cemetery is maintained by the parish of St. John Evangelist Anglican Church of Crapaud. A path leading to the cemetery is accessible from the communication tower site. My grandfather, Robert Bruce Stewart Jr., was the oldest son of Helen Birnie and Robert Bruce Stewart. My father, Walter Fitz-Alan Stewart, was the second of Robert Jr.’s sons. The small trunk/sea chest, with the initials H.S.B. on its lid in brass nail heads, belonged to my great-grandmother, Helen Stewart Birnie Stewart. It probably accompanied her in 1846 when she travelled to the Island with her husband and their young children. In July 2016, her trunk was given by my family to the History Committee of the Friends of Clyde River for their museum. Thank you to the Stewart family for this donation which represents an important part of the history of Prince Edward Island. Link to Strathgartney Cemetery – Canada Historic Places here. Public archives letters (George and Alexander Birnie), more info here. Mount Stewart is named after Captain John Stewart. Walter Fitz-Alan Stewart was a farmer, fox rancher and Liberal MLA, more info here.